Two years ago, someone driving a tractor trailer hit and killed Joe Lavins as he rode his bike through Porter Square. To commemorate Lavins’ death, and to help prevent future fatalities from truck-bicycle collisions, a coalition of Boston-area nonprofits, along with the Somerville Bicycle Advisory Committee, have created an instructional video to help train drivers of large vehicles how to safely maneuver our changing Boston streets. The video will also be useful for bicyclists, pedestrians and automobile drivers to view, as many of the safety issues raised are relevant to all transportation modes. SAFER TRUCKING in Changing Cities from FOV videos on Vimeo. 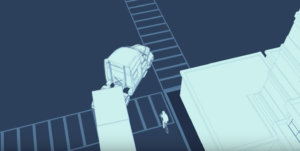 SAFER TRUCKING IN CHANGING CITIES from Fields of Vision on Vimeo. “Joe was a careful cyclist that took measures to ride safely on his commute from Lexington to Cambridge each day. His tragic death might have been avoided with better visibility gear on the truck that struck and killed him” said Caroline Kurtz, friend and colleague of Joe Lavins. It’s not just that these vehicles are far heavier than others on the road. They also suffer from design flaws — such as lack of crossover mirrors, obtrusive hood and cab geometry, and the elevation of drivers above other traffic — that hinder near-field visibility. This is especially problematic for right turns, when drivers can essentially be operating blind for several seconds. Compounding these issues, many trucks still do not feature side guards to prevent people from being dragged under the wheels of a truck during crashes. Boston, with its narrow, winding, and often confusing roads, only increases the likelihood for these built-in challenges to result in tragedy. The fatal crash that occurred Friday, October 5th, where a young woman walking in Cambridge at Putnam and Magazine was struck and killed by someone operating a dump truck, is another reminder that these trucks are deadly and all available safety technologies and practices should be deployed by fleet managers and truck drivers to prevent such tragedies. So, too, is the fatal crash on Friday, November 9, involving a dump truck and a Boston University graduate student. The video “Safer Trucking in Changing Cities” is the product of the Joe Lavins Fund for Bicycle Safety. The fund is a joint project involving advocates from the Boston Cyclists Union, MassBike, Somerville Bicycle Advisory Committee, and LivableStreets Alliance, that aims to promote bicycle safety in the Boston Metro Region through education and advocacy for policy change in memory of Joe Lavins and others who have lost their lives in bicycle crashes involving trucks and other large vehicles. These groups, and others, have also been actively promoting Vision Zero commitments from area city and state governments to make road and intersection improvements needed to eliminate serious injuries and fatalities. Vision Zero is a policy, adopted by the City of Boston in 2015, Cambridge in 2016, and Somerville in 2017, that is a stated commitment to eliminating traffic fatalities through a multi-disciplinary approach to ensure the basic right of safety for all people as they move about their communities. Vision Zero shifts the priority of transportation policies and projects from speed to safety, with the philosophy that fatal and injury crashes can be avoided if streets are designed to protect all people. “Boston still has a long way to go to achieve the Vision Zero principles of a systems-wide, equitable, people-centered approach. We hope that promoting this video will connect with drivers and remind policy-makers of the human cost of failing to take preventative action to protect our most vulnerable road users,” said Wolfson.